When I was pregnant with my daughter, I took a class at the hospital on creating a safe home for babies—childproofing, switching out harsh chemical cleaning supplies for nontoxic alternatives, that sort of thing. The nurse teaching the class recommended using vodka as a natural kitchen counter cleaner. 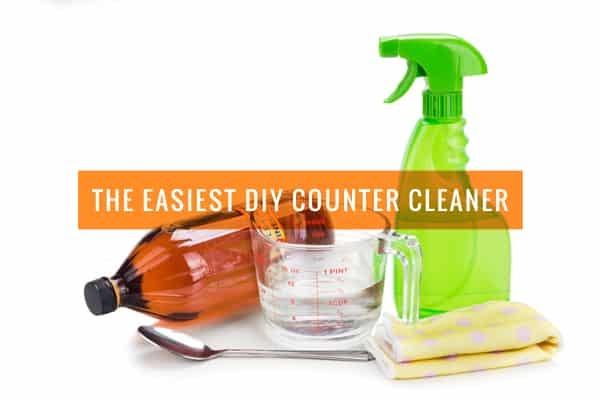 While I’ve yet to try that, her recommendation to switch out traditional cleaning products with safer alternatives stuck with me and I found a counter cleaner that’s even cheaper than vodka and just as effective—and I bet you already have it on hand. That’s it! You can add a few drops of any essential oil you have on hand too if you like (just be sure to shake the bottle before you use the spray, since oil and water don’t mix). I use these glass bottles for my homemade cleaners—they are the best I’ve found, but any bottle with a spray nozzle will do. I know what you may be thinking—doesn’t cleaning your kitchen with vinegar make it smell bad? No! This spray has equal parts vinegar and water, so it has a light vinegar scent, but it’s not that bad and what little smell there is dissipates quickly. I also add a few drops of essential oils—this is optional, but it helps cut the vinegar smell and depending on the oils you use, it can add even more antibacterial properties to the spray. I’m currently using a combination of tea tree oil and bergamot, both of which kill germs. Alternately, you can make infused vinegars with a variety of ingredients to add some natural scent to your cleaner. This spray is best for your daily kitchen counter wipe-down—it sanitizes your counters and degreases, but it’s not a heavy-duty scrub, so if you have a big mess on your hands, I’d recommend something else. Also note that there are differing opinions on whether vinegar can or should be used on natural stone countertops, as acid can etch the finish on stone. I’ve used this counter cleaner on quartz counters without any etching; I believe this is because the vinegar is diluted, but if you have granite, marble, or quartz countertops, you may want to use an alternative cleaner. I usually use the concentrated Mrs Meyers cleaner. But recently started using vinegar soaked in orange peels. Its a great use for something that would otherwise go to waste. Just soak straight vinegar with whatever peels you have for a week or longer in a mason jar. Pour out the vinegar as you use it to clean. You can even reuse the orange peels to soak 2-3 more times to get more out of them. The orange definitely increases the cleaning and grease power! It works better than the crazy toxic stuff I had been getting to clean the stovetop (I’m a VERY messy cook). The orange peel eliminates any vinegar smell at all and replaces it with a citrus scent. I’ve also found I don’t need to use a 1:1 ratio for general cleaning. I use 6-8oz/32oz spray bottle.